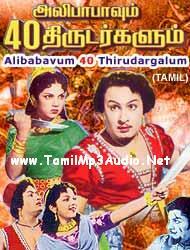 Watch Online Tamil Movie Alibabavum Narpadhu Thirudargalum (Alibabavum 40 Thirudargalum) Screened in the year 1956 Starring M.G.Ramachandiran , Banumathy , Thangavelu , P.S.Veerappa and Others . Songs in the Movie is Written by Marutha Kasi . It was the first Tamil colour film.